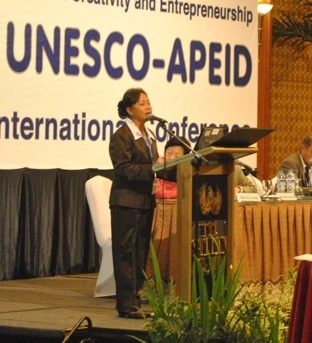 “When I got the invitation from UNESCO to be a speaker, I was very excited, because I never thought that I could be recognized by so big organization especially this is the international conference. I was panic, because I felt I didn’t have enough knowledge. But in the end I could do it with help from Lori Carlson, PLF president and Farida , my dear cousin and some people staying in 7 Candles guest house . I wrote the presentation and Lori help to correct only a few things, Farida help me to put it in powerpoint, the guests in the guest house help me when I practiced it many times at home. A little bit difficult when Lori had to buy her ticket when we wanted to get in the same plane. Expensive for her. But however she got it. Going inside the airport we talked a lot about our students if they could get a field trip in the airport. That would be fun~! Getting to Jakarta, excited. The morning we walked around the hotel to look for the restaurant for breakfast, the conference room. I was excited to meet many important people in the conference. Many speakers from different countries sharing their experiences as well they gave the lesson the same as the teachers in the university to the students. I understood some, not all. But what I got in my brain from the conference are important to share to the schools, to my family and my friends. The whole family feel to be honor of this big event very much. I was very happy to give the speech when I saw people listen and understand me very well. Here is the link if you want to see the video. I wish to give the speech again and I hope more and more people in the world can help our world to be good, get out from the poverty by using the education to get the creativity and entrepreneurship.